Also known as critical path analysis, the critical path method (CPM) is a widely used technique for analyzing and managing task sequences in large projects. Based on calculating how long it takes to complete essential steps of a process and analyzing how those steps interrelate, CPM is a visual and mathematical technique that gives managers the ability to effectively plan, schedule, and evaluate their projects. CPM-associated techniques are probably most often used in large manufacturing and construction projects, but they are also applied to tasks like new product development cycles, marketing campaigns, software process modeling, and research programs. Any time a manager is trying to determine the date by which a project will be completed, he or she needs to have a basic understanding of the time required to complete each task that makes up the overall project. For small projects, managers are often able to memorize and to coordinate all of the various tasks necessary for their completion. For larger projects, however, with numerous activities occurring simultaneously, remembering and coordinating these activities can prove much more difficult. CPM and related tools allow managers to determine which particular tasks most affect the total time of the project and enable managers to better schedule each task so that deadlines are met at the least possible cost. In the mid-1950s, researchers became increasingly interested in efficiency regarding scheduling problems associated with large projects. One study was conducted in Great Britain by the Operational Research Section of the Central Electricity Generating Board. The board examined problems associated with refurbishing a generating plant, a very complex project. By 1957 it had come up with a technique that identified the "longest irreductable sequence of events" (later renamed "major sequence" of events). This technique was used in an experimental overhaul of a power plant; in the end, it reduced the time spent to complete the overhaul to 42 percent of the average time required to complete such projects. At the time, officials involved pointed out that, while delays in this major sequence would delay the project's completion, delays in other activities would not necessarily have an impact on the completion time. Meanwhile, similar work was underway in the United States. In 1958 the U.S. Navy established a team to formulate a way to plan and control complicated projects. The investigation was referred to as the Program Evaluation Research Task, code-named PERT. By February of that year, Dr. C.E. Clark, a mathematician on the PERT investigation team, introduced the first arrow diagrams. Later known as the Program Evaluation and Review Technique, PERT was applied to the Fleet Ballistic Missile Program in October 1958. Not only was this endeavor a massive project to oversee, with 3,000 contractors, vendors, and other parties involved, it was also strategically significant to complete it as quickly and efficiently as possible. PERT proved to be a successful management tool and was credited with taking two years off the estimated time to develop the Polaris missile. Simultaneously, similar work was being undertaken in the private sector. For example, the E.I. du Pont de Nemours & Co. devised a technique, known as CPM, to control its large projects. The technique saved the company $1 million in the first year of its implementation. By 1959, Dr. Mauchly of the Du Pont effort established an organization to solve industrial problems using CPM. Since that time, a great deal of work has been completed to improve upon all of these related techniques, much of it by people in the computer industry. For CPM to be used appropriately, a project should have three attributes. First, it must consist of tasks that are independent of each other, which managers can stop and start within the duration of the project. Second, the distinct tasks, upon completion, must result in the end of the project. Third, while some tasks can be performed simultaneously, others must be performed in a particular sequence. To plan a project using this method, a diagram of each of the tasks comprising a project must be devised. The diagram can be constructed by, first, assigning a symbol (such as X, Y, or Z) or identifying label to all of the tasks and listing them in the order that they are to be performed. The time estimated for each task to be completed should also be calculated, or at least estimated. Take, for example, a delivery project involving the transportation of goods using three trucks. The project will start at place W, where all the trucks start out, and end at place X, where they all ultimately arrive. Trucks A and B go first to place Y; from there Truck A goes to place X, while Truck B goes to place Z and then eventually to place X. The third truck (Truck C) goes directly from place W to place X. These events are represented in Figure I (this sort of visual CPM representation is sometimes called a "network diagram"). The estimated times needed to complete the individual segments of the trips are shown in the illustration. To analyze this scenario, the manager must figure out the shortest amount of time in which it is possible to complete the project, given that all of the individual tasks are necessary and take fixed amounts of time to complete. 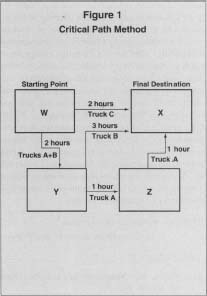 For the above example, the answer is 5 hours, the time needed for Truck A to leave place W, go to place Y, and reach place X. Trucks B and C take only four hours and two hours, respectively. Thus, Truck A traveling from W to Y to X is seen as the critical path. Anything delaying that truck will delay the project, while any delays experienced by the other two trucks would not be significant, unless they pushed the project beyond 5 hours. Defining the critical path can allow the manager to concentrate his or her efforts appropriately and make optimal scheduling decisions. Thus, it follows that if the project manager can reduce the time it takes for Truck A to complete its path, the overall project will save time. He or she will not waste efforts on reducing the time spent by Trucks B and C. Furthermore, knowing that Trucks B and C have more time to complete their tasks, the manager can schedule them more conveniently. For instance, Truck C is unoccupied for three hours and could be used for other tasks during that time. Similarly, from this analysis the manager knows that the drivers for Trucks B and C will be idle during the course of this project and their labor can be used for something else, rather than paying all three drivers for the project's full duration. Finally, by using CPM, the manager can control the project as the tasks are being completed. Comparing the actual performance with the planned performance will let the manager know whether or not the project is on schedule. Thus, if Truck A is behind schedule going from place W to place Y, the truck's trip from point Y to point X will have to be expedited—that is, if the project is to be completed on time. The principles behind this simple example can be leveraged on much larger and more intricate projects, frequently with hundreds of steps. In practice, CPM and related project management techniques are usually implemented through the use of project management software. Software packages may be general use, mass-market titles or specialized project software, such as for the construction industry. These programs help automate the process of breaking a project into its essential tasks and subtasks and tracking any number of variables associated with each step, including costs. The software may also offer graphical representations of the project timeline and generate customized reports on various project aspects. Tasks in a CPM analysis are often identified with a range of potential start and finish times, as opposed to just one, to indicate best- and worst-case scenarios. Most software packages allow this kind of tracking. This enables management to consider a more complete set of possibilities, rather than simply querying whether the project is on or off schedule. It also opens the door to more nuanced analyses, such as finding the maximum allowable time for a problematic task if all other tasks are performed at optimal times. In real life, one project's schedule often impacts other schedules, and thus CPM software and analysis is also applied to a multiple-project environment. In this case, individual steps within projects or the entire outcome of a project can be linked with phases of other projects, providing managers a means through which they can optimize scheduling across projects to maximize efficiency and serve other strategic functions. When integrated with cost tracking, CPM is sometimes known as "least cost scheduling." By linking time variations with anticipated costs, the CPM model can be used to calculate the optimal project schedule to minimize costs. This can indicate, for example, that it is cheaper to take longer at some things, but not others. At the very least, it can indicate what the financial consequences will be if the project falls behind schedule at any particular stage. CPM has also been used in conjunction with statistical process control, a set of mathematical methods aimed at monitoring and improving efficiency and quality, to maximize these benefits in the course of completing a project. Busch, Dennis H. The New Critical Path Method. Chicago: Probus Publishing Company, 1991. Giammalvo, Paul D., Djodi Firman, and Evi Dwiyani. "Implementation of a Continuous Process Improvement Program Using Data from CPM Schedules." Project Management Journal, June 1996. Moder, Joseph J., Cecil R. Phillips, and Edward W. Davis. Project Management With CPM, PERT & Precedence Diagramming. 3rd ed. Middleton, WI: Blitz Publishing Co., 1995. O'Brien, James J. CPM in Construction Management. 5th ed. New York: McGraw-Hill, 1999. After reading this article, I waas looking for the answer to a subject I have been trying to answer after extensive research. I can't seem to find a lot of information about what techiniwques were used pre-CPM. I am trying to find out or figure out what makes John Fondahl CPM scheduling different than all the ones that were being used up until then.